Kokomo graduate Mitchell Gauger (right) with his IUPUI Garland Award. 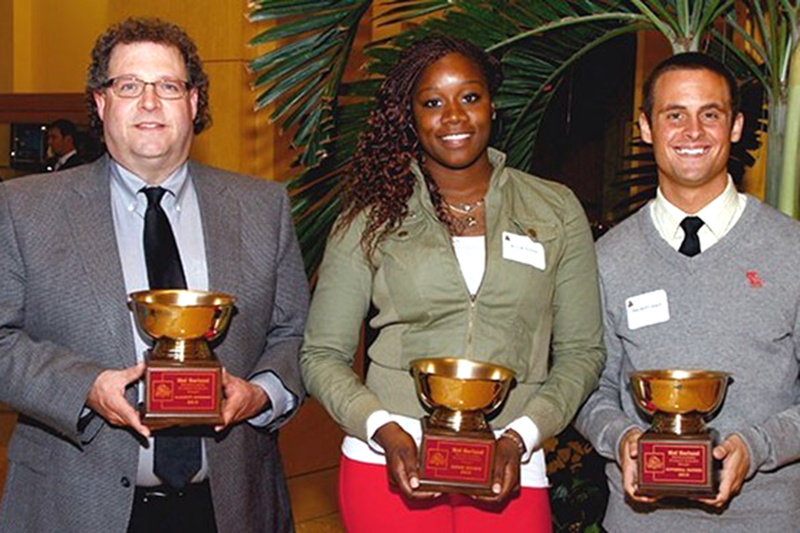 INDIANAPOLIS – IUPUI men’s diver Mitchell Gauger, women’s swimmer Elizabeth Bourgeois and women’s basketball player Kerah Nelson have been named the 2012-13 IUPUI Melvyn Garland Distinguished Student-Athlete award winners as the athletic department announced its major award winners on Apr. 26. Additionally, women’s cross country’s Kaci Verkamp earned the Dorothy Cheesman Award and men’s swimmer Josh Davis was named the Jaguars Athletics Club Academic Achievement Award winner. All of the honorees were recognized at the annual Senior Dinner, held at the NCAA Conference Center. The Mel Garland Awards are the highest single honors given to a male and female senior student-athlete. The winners are chosen based primarily on athletic achievement, while also considering scholarship, mental attitude, leadership and perseverance. The award is named after the former IUPUI Athletics Director/Basketball Coach who died of leukemia in 1983. Gauger, a Kokomo High School graduate, recently capped off a four-year career with the men’s swimming and diving program by earning Diver of the Championships at the 2013 Summit League Swimming and Diving Championships. In his four seasons, he was a four-time All-Summit League selection – twice in the one-meter dive and twice in the 3-meter dive. Twice in his career, Gauger also advanced to NCAA Zone C Championships, and he ranks sixth in IUPUI history in the one-meter dive with a score of 320.62. This past spring, Gauger was chosen among IUPUI’s Top 100 students and ultimately named among the university’s Top 10 Males at the 14th annual Top 100 Dinner. At Kokomo, he was a second team all-state performer and a medalist at the 2009 IHSAA diving state finals. Gauger, a business management major, is the son of Gary and Lisa Gauger. A four-time All-Summit League selection, Nelson finished off her four-year career by leading the women’s basketball team to its first-ever postseason appearance in its Division-I era when it competed in the WNIT back in March. An All-Summit League Tournament selection as a senior, Nelson tallied 1,614 career points to make her the program’s all-time Division-I era leading scorer, and finished her career ranked among the Top 10 in IUPUI history in rebounding, field goals made and free throws made. En route to earning first-team all-league honors as a junior – the first of two straight first-team selections – Nelson scored a program-record Division-I era record 518 points and her 16.2 ppg was the highest single-season scoring average since the 2002-03 campaign. As a senior, Bourgeois helped lead the women’s swimming and diving team to a second-place finish, its best since the 2005-06 season. At the most recent conference championships, Bourgeois was the runner-up in the 100 fly with a new school-record time of 54.63, in addition to finishing third in the 100 free and fourth in the 50 free. Her 100 free time of 51.23 and her 50 time of 23.65 were also new school records. The Cincinnati, Ohio-native finished her career with four individual school records and was part of four relay school records. Additionally, her personal-best times in the 50 free and the 100 fly also rank in the Top 10 in Summit League history. 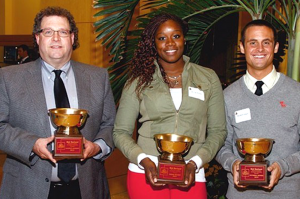 Academically, Bourgeois was named IUPUI’s Most Outstanding Female Student at the 14th annual IUPUI Top 100, becoming the third IUPUI student-athlete to be named Most Outstanding Student, joining Carrie Lightfoot (2000) and Tiffany Kyser (2002, 2003). Verkamp was honored with the Dorothy Cheesman Award as the top female academic achiever in this year’s graduating class. A native of St. Anthony, Ind, Verkamp has maintained a 3.97 GPA while majoring in Exercise Science in the School of Physical Education & Tourism Management. Verkamp has been on IUPUI’s Academic Advisor’s List every semester of her college career and been on the Summit League’s Commissioner’s List of Academic Excellence twice. Additionally, she was voted Academic All-Summit League this past season in cross country and been recognized among IUPUI’s Top 100 students each of the past two years. Davis was honored with the Jaguars Athletics Club Academic Achievement Award as the top male academic achiever in this year’s graduating class. The Valparaiso, Ind.-native boasts a 3.94 GPA, majoring in chemistry within the School of Science. Davis has been named to IUPUI’s Academic Advisor’s List every semester of his college career and has twice been named to The Summit League Commissioner’s List of Academic Excellence.